The large ancient complex is believed to have once been a ceremonial and administrative center that peaked sometime between 600 and 1200 AD; its construction has been attributed to a tribe related to the Maya. Still, there are many questions outstanding about the inhabitants of this ancient city, and many of the buildings remain engulfed in jungle vegetation. 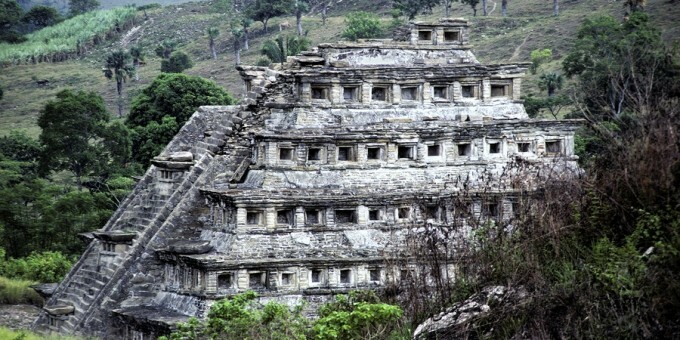 El Tajin has some very unusual structures. Over 150 buildings have been identified on the site, although so far only around twenty have been excavated and restored. Most archaeological sites you visit in Mexico were buried under mounds of earth and grass—reclaimed by the land after several centuries of abandonment. El Tajin is one of Mexico’s most enigmatic archaeological sites. A comprehensive archaeological excavation project keeps revealing even more unusual buildings here including temples, palaces and ball courts. As El Tajin unravels with surprising complexity, it keeps throwing up more and more mysteries. Like other archaeological sites in Mexico, the structures seem to resemble calendars and time—an example being the pyramid of Niches, with its 365 recesses. Game courts feature heavily here—over a dozen have been discovered already, and recent technological advances in imaging have revealed more ball courts lying underground, reinforcing the theory that El Tajin was an important ceremonial center. As with some other archaeological sites, it is clear that human sacrifices were made at El Tajin too, and it’s believed that these were connected with the games played here. This site is fascinating because it is so “new” in terms of what is being done and found. The structures being revealed are quite unique and unusual. If you’re looking for a site that still holds a strong feeling of mystique and wonder, then visit El Tajin. For those traveling along the Gulf coast or near Veracruz, a visit to El Tajin will be a stimulating and worthwhile experience. Of the twenty or so structures thus far excavated and restored, one of the most interesting is the 60-feet high Piramide de los Nichoes (Pyramid of Niches), which had 365 niches, painted red on the inside, blue on the frames, suggesting to archaeologists that this pyramid was used as some kind of a time measurement device. Friezes and relief depict the Tajin ruler and other ceremonial scenes. The Plaza Menor (Minor Plaza) was thought to be one of the main ceremonial centers of El Tajin. Juego de Pelota Sur (Southern Ball Court) is the most remarkable of the game courts found so far, as its walls have carvings depicting the ritualistic games, and revealing that at least one of the contestants was sacrificed. By Air – The closest airports to El Tajin are Poza Rica and Veracruz. For detailed information about flights and flying, see the Mexperience guide to Air Travel in Mexico. By Car – El Tajin is located about 150 miles north of Veracruz. From Veracruz, take Highway 180 north along the coast to Papantla. From Mexico City, head northeast on Toll Highway 132 towards Tuxpan. At Poza Rica, bear south towards Papantla. Also see additional information about Driving in Mexico and Mexico’s Toll Roads on Mexperience. By Bus – Regular buses make the trip from Veracruz to Papantla. For detailed information about bus transportation read the Mexperience guide to Bus Travel in Mexico. Local Tours: Mexperience offers access to local tours and activities in the Veracruz region of Mexico. Tours and activities are organized and run by well-established, professional and fully-insured operators. You can search for tours by location or category and make reservations online or by telephone. Buying tours in advance is more convenient and secure, and your spaces on the tour are guaranteed. Photography & Video: A permit is required if you want to use a tripod to take photographs at the archaeological site. A small fee is made for the use of handheld video equipment. Read the section on Mexperience Mexico Essentials about Video & Photography at archaeological sites in Mexico. Local Tours: Local tours are available to El Tajin. Ideal Clothing & Footwear: Wear comfortable walking/hiking shoes with a non-slip sole; strong shoes will support your feet and ankles if you plan to climb pyramids. El Tajin enjoys year-round, hot, sultry and humid weather as it’s by the coast. It’s especially hot in May and June. Wear light clothes that allow your skin to breathe. Take sun screen, a hat and sunglasses. Keep yourself hydrated by drinking plenty of bottled water at all times.